This is one of my favourite snack item. This is solely an experiment by my better half. An evening snack with a difference. Try it out – am sure you too will like it. Soak the noodles in water for some time. Take the soaked noodles in a bowl and add eggs, chopped onions, green chili and salt. Mix well. Take oil in a frying pan. Make small balls out of the mixture and deep fry till it attains a texture of light golden brown. Serve it hot with ketchup and enjoy it with a cup of coffee. It will be crispy and tasty snack for the evening. Thinking that what if you are vegetarian? No worries!! You can use besan in place of eggs.Simple!! Oh wow, noodles and pakodas both are my favourite. This is good and delicious fusion. I shall try it. I have tested maggi pakoda and the man who cook them, he starts with cooking masala maggi first, then from that maggi, he Cooks pakoda. He makes some lip smacking maggi pakoda. Similar to this, lip smacking dish. 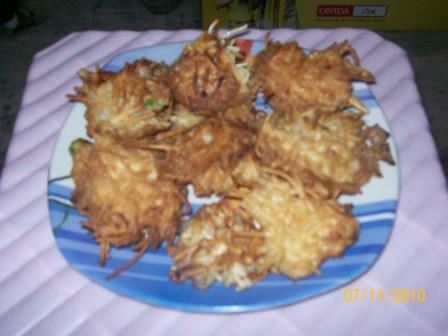 Noodles pakoda. Sounds interesting. Have never tried. Its simple too. This is an easy recipe yet equally delicious. Trying this soon. I’m not very fond of cooking but when it comes to eating part, I love to try new dishes. This looks interesting! Hopefully I will try to make this some time. ? Seems pretty easy to cook. I also love to travel and I’ve recently switched to a healthier lifestyle and training for a race with SportMe running app, which calculates distance, time, pace and calories. Finding new running routes is always a challenge, such as sneaking in my runs into my destinations. Your blog posts are a true inspiration. Thank you so much Iris. This comment means a lot to me. I’m glad that my posts could be an inspiration for you. Sounds yummie! Will definitely try this recipe Samik. Such a simple recipe, but it must be delicious. Thanks for the share. Interesting recipe. Fuses two of the most loved dishes in my household. Will give this a try. Yummy tasty delight! Thanks for giving a vegan alternative. Noodles pakoda looks yummy. I have had maggi pakoda here in Ahmedabad. And I think they will taste similar to these noodles pakoda. Noodles pakoda..hmm..yumm. Never tried it. But sounds easy. I will try it soon. Thanks Alpana. Yes its pretty easy to prepare and taste yummy too. Try it out and let me know your experience. Thank you Disha for reading and commenting on my post. I love to have noodles pakoda! Me too. Its a great choice for evening snack.